Significantly revised and updated, the new edition of this highly regarded reference on the shoulder continues to impress. 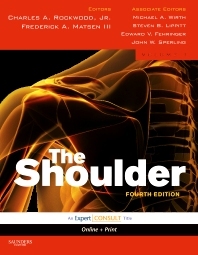 A multitude of leading international authorities—30% new to this 4th edition—present today’s most comprehensive, in-depth view of the current state of shoulder practice, all in a beautifully illustrated, full-color 2-volume masterwork. They deliver the most up-to-date coverage of shoulder function and dysfunction, along with practical approaches for patient evaluation and balanced discussions of treatment alternatives—open and arthroscopic, surgical and nonsurgical. Greatly expanded and visually enhanced coverage of arthroscopy, as well as many new chapters, provide expert guidance on the latest minimally invasive approaches. New “Critical Points” summary boxes highlight key technical tips and pearls, and two DVDs deliver new videos that demonstrate how to perform open and arthroscopic procedures. And now, as an Expert Consult title, this thoroughly updated 4th edition comes with access to the complete fully searchable contents online, as well as videos of arthroscopic procedures from the DVDs—enabling you to consult it rapidly from any computer with an Internet connection. Includes tips and pearls from leaders in the field, as well as their proven and preferred methods. Offers scientifically based coverage of shoulder function and dysfunction to aid in the decision-making process. Provides a balance between open and arthroscopic techniques so you can chose the right procedures for each patient.